Winter is coming, and for some that means dandruff. Fear not, Equate makes a great dupe of the Head & Shoulders dandruff shampoo. We recommend you switch and save some cash! The Equate brand will save you some cash and keep your scalp looking clean! Brandefy compares store brands (e.g., Equate) to name brands (e.g., Head & Shoulders) to reveal when the store brand is as good as the name brand, and to warn you when it is not. Our goal is to help you save time and money, and to have a good time while doing it. Winter requires some serious work to combat dry skin and flaky scalps. 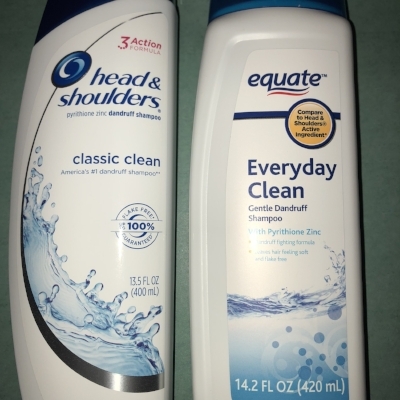 We grabbed these shampoos to see how the Equate brand stacks up to Head & Shoulders. We found the color, consistency, and smell to be very similar. Both shampoos are a soft light blue, with a light but fresh scent. Additionally, they are creamy and smooth in consistency. They both require you to give them a good scrub through the hair. Upon using both shampoos, we liked the after feel and wash. They both are helping our scalps so far, and allowing us to wear black confidently! Ingredient panels are similar, but not the same. We will be saving some cash and making the switch over here... at least until spring and we don't have to combat the flakes!